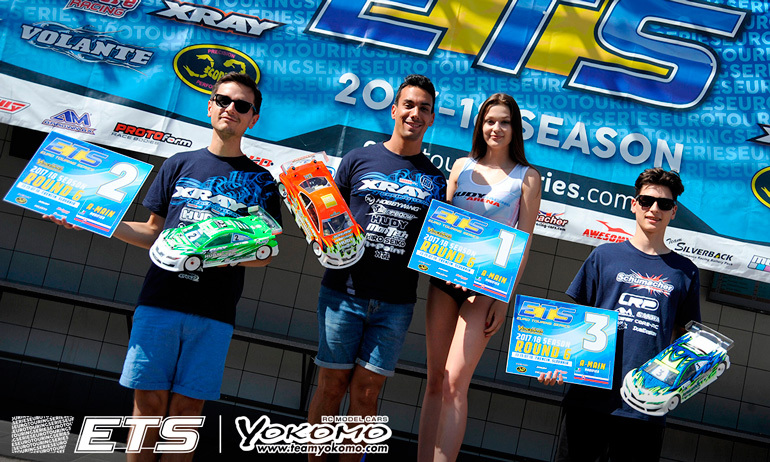 Alexander Hagberg and Michal Orlowski completed the podium at the Yokomo Euro Touring Series season finale this afternoon in Slovakia. 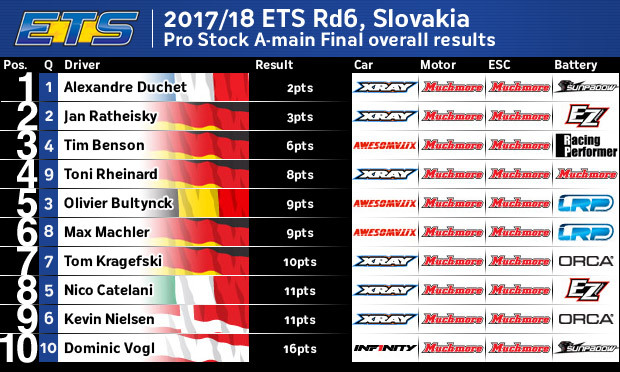 While Bruno Coelho wrapped up the overall win in A2, the ETS Champion opted to run the third A-Main at Hudy Arena after not being 100% happy with his car in A1 & 2 and again he lead home another stagnated Top 3. 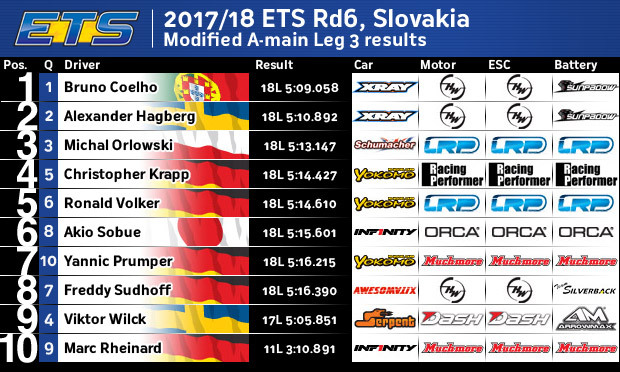 Winning by his biggest margin of the three encounters, Coelho would finish 1.8-seconds up on Hagberg with the result securing Xray another 1-2 finish at their home track. 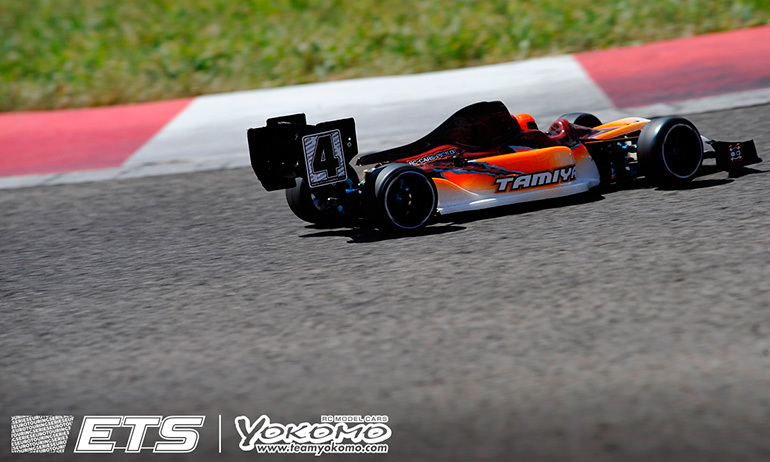 For Hagberg, today’s 2nd place would also help him to move ahead of Yokomo’s Ronald Volker in the final end of season standings to finish 3rd overall behind Marc Rheinard, the Infinity driver having another difficult weekend. 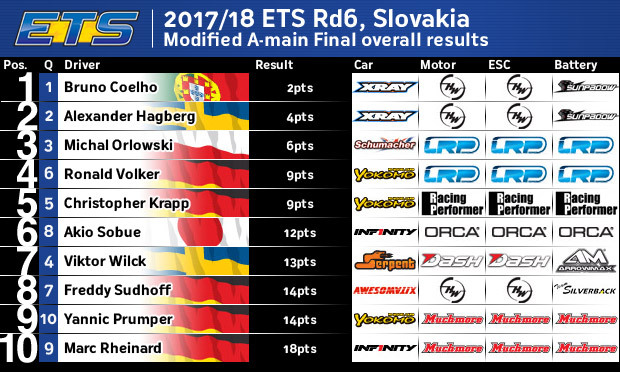 Finishing A3 over 2-seconds back on Hagberg, Orlowski would cap off an impressive weekend by securing his first ever ETS podium. 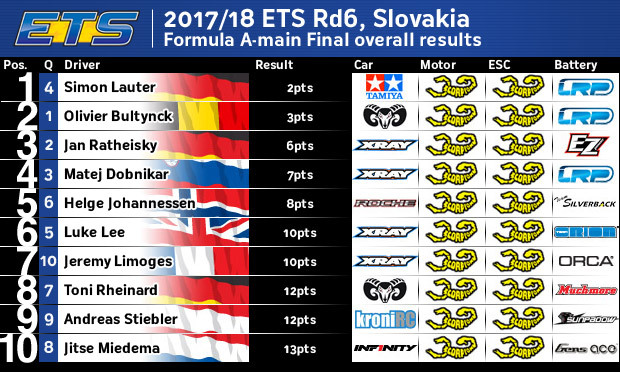 Having started his career in the ETS but moved over and becoming a star and champion of the Euro Offroad Series, today’s result should see the Schumacher driver return to his roots and become a contender for the title of both disciplines next season. Unusual for Coelho to wrap up the win in A2 and then run A3, today’s win his fourth of the season, Coelho ran it on this occasion having had slight issues with traction in the early part the opening to A-Mains. He explained, ‘we couldn’t throw away the opportunity to check the car in race conditions’. Running a number of warm-up laps and even doing a practice start, he said, ‘everything felt good this time. After A1 we adjusted out additive strategy but it still wasn’t perfect so we made a set-up change for this one and it worked’. Originally putting his loose car in A1 down to having made contact with the barrier in the final qualifier and damaged something, he said, ‘I think the weather was the main problem. We had a lot of sun today and it was sunny too for A1 yesterday but it was cooler the days before’. With the winners of Pro Stock and 40+ also decided after A2, the big attention of A3 was on Formula. With a clash between Top Qualifier Olivier Bultynck and Jan Ratheisky in A1 handing Simon Lauter the win, Bultynck would get the job done in A2. 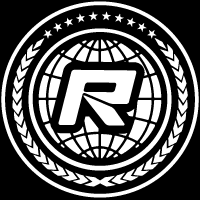 This put the Shepherd driver up against the Tamiya driver and Ratheisky’s Xray for the overall win going into A3 but once again they would make contact. With Ratheisky getting passed Bultynck on the first lap, they would make contact with the Belgian forced to wait and give back the position but more contact was to follow and it was Lauter who was the benefactor. 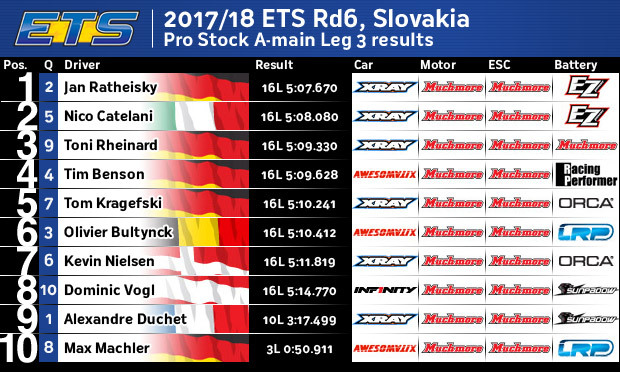 Winning the Main from Bultynck, Lauter claimed his first ETS win with Bultynck and season Champion Ratheisky each side of him on the podium. In Pro Stock, winner Alexander Duchet was joined on the podium by A3 winner & Xray team-mate Ratheisky with Tim Benson third. 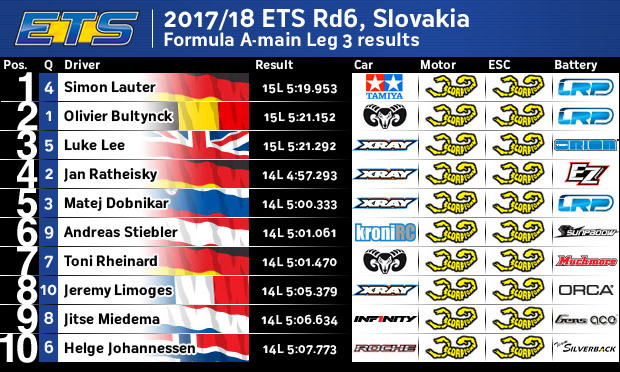 In 40+ new champion Thomas Oehler could sit out A3 allowing Beni Stutz to come through for the win but overall it was Italian Roberto Fabiano who finished 2nd with ETS Spain winner Christian Drießle completing the Round 6 podium to secure second overall in the championship.